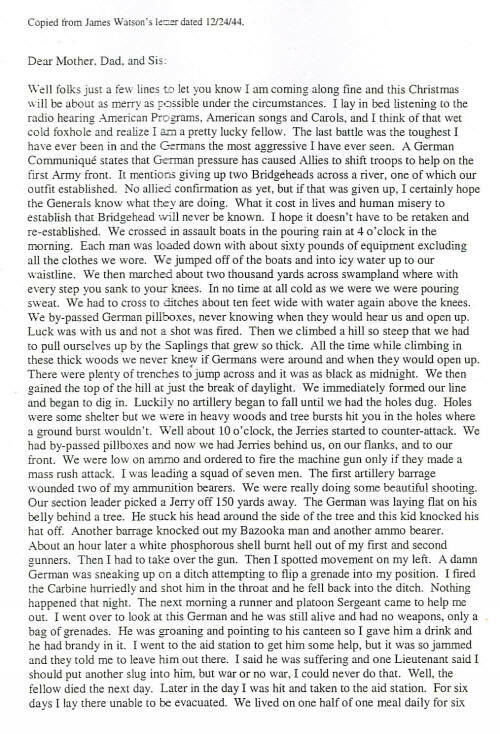 Mr. Bob Watson of Tucson, Arizona -- himself a WW2 veteran -- provided the following information relating to his brother, James C. Watson, who had served with the 90th Infantry Division, which had been attached to General George Patton's Third Army during its push into Germany in 1944/1945. Mr. Watson wants to insure that his brother's heroism is not forgotten. The material below is a wonderful tribute to a wonderful World War II Hero. Second newspaper clipping: Dated May 2, 1945.
of her husband being listed as Missing in Action. V-Mail by James Watson to his parents and sister. Well folks I was wounded again on Dec. 8th in Germany. A shell fragment in the calf of my left leg. I lay six days in a pillbox of the Segfried line unable to be removed due to intense enemy shellfire. The finally got me across the river and the leg has been operated on and the shrapnel removed. I am now in the hospital but will move to a convalescent camp in a day or two. I will send my address from there. The battle was tough and there are Dead Germans laying out there as far s the eye can see. Our losses were unbelievably light, but we did take an awful beating from "Trench Foot." This was due to being soaking wet and cold so long. Received Sis' pkg the nite we pushed off but due to the fact that I will be moving her and there, the others will probably never catch me. I must close, May God Bless you all. 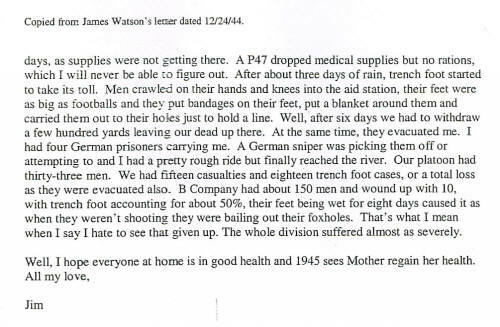 Christmas Eve, 1944 letter by James Watson to his parents and sister. Excellent transcription of the above letter by the brother of James Watson, Bob Watson. There is a sad, but often typical, footnote relating to James Watson. After enduring intense fighting as a member of the 90th Division, and being twice wounded in combat, he returned to his home and family in Chicago after discharge only to be killed in an automobile accident eight months later. The above photo essay, "War Memories of James C. Watson", was forwarded to us by James' brother, Bob. The material is re-printed here on World War II Stories -- In Their Own Words with the kind permission of Mr. Watson. Our sincerest THANKS to Mr. Watson for allowing us to share these excellent memories. We at the World War II Stories -- In Their Own Words web site wish to offer our most profound THANK YOU to Mr. Watson for the kind offer to share these excellent images of his brother. The images above are a family tribute to the memory of their World War II hero. Original Story submitted on 17 September 2004. Story added to website on 22 September 2004.